If you would like to sign up for any of our classes or workshops, please call the shop at (302) 732-6304 and we will be happy to sign you up! You can then either stop by and pick up your class supply list or request to have one e-mailed to you. We will let you know if the class you have requested is full. If this is the case, then we can place your name on a waiting list. If for some reason someone decides that they cannot attend the class after signing up, we begin to call those people who are on the waiting list. Most of the time if we have a large interest in a particular class, we will schedule to have the class again and then begin to contact the people on the waiting list before offering the class to the public. Full payment is required when you register. We cannot guarantee a place will be held for you without payment. You can register in person, by phone or by mail. as a credit or a refund will be issued. To receive a refund or credit, you must cancel 1 week prior to class. No refunds or credits will be given if you do not show up for a class. Supplies are in addition to the class fee. We offer a 20% discount on all supplies for most of our classes. A supply list is provided for all classes. Be sure you receive one prior to class and bring everything listed. We endeavor to have all supplies in the shop but cannot guarantee they will be available on the day of the class, so be sure to shop early. All students must have a legal copy of the required pattern or book. You must provide your own sewing machine in good working order, along with the cords, pedal and the users’ manual. All classes, including beginner classes, require you to know how to use your machine, including attaching various feet as required for the class. Please arrive at least 15 minutes before class so you can be set up and be ready to start on time. Please silence your cell phone in consideration of the other students and the teacher. Unless specified otherwise, bring basic sewing supplies—thread, scissors, seam ripper, pins, marking pen/pencil, all the things you usually use when you sew. PLEASE REFRAIN FROM WEARING PERFUMES AND FROM USING SCENTED PRODUCTS. This ensures a productive and pleasurable experience for the instructor, staff and students - especially those with allergies. THANK YOU! Paper Piece this small wall hanging to improve your paper piecing skills. This is a two part class. PREREQUISITE: Intro to Paper Piecing Class or prior paper piecing experience. In this class you will learn fun and easy designs that will allow you tostart finishing your own quilt tops. You will be shown overall designs plus designs that will work in blocks, triangles, and sashings and borders. You will leave this class with a multitude of designs and ideas on how tostart your journey in free motions quilting. Learn the basics, including choosing your fabrics, rotary cutting, machine piecing and quilting. Go home with mostly finished projects after each class. Class uses Pat Sloan's "I Can't Believe I'm Quilting" book. For all alumni of Barbara's Blue Onion & Friends Class - Barbara will assist you in finishing the Quilt you started (Blue Onion, Twirl, Trading Places or Spin Cycle). Whether your hang-up is in cutting, piecing or assembling the blocks - she will provide the jump start you need to "Finish It Up". Prerequisite: Must have attended a previous Class for the Blue Onion, Twirl, Trading Places or Spin Cycle patterns. Bring the supplies listed on the original supply list given to you for your class. In addition, if they are interesting in arranging the blocks, a flannel-backed vinyl tablecloth would be useful. Overcome the fear of cutting and piecing ovals! In this class, Barbara will demonstrate how to use the new Creative Grids- Ovals All Ways ruler designed by Karla Alexander. The Ovals All Ways Ruler is designed to cut quarter, half and full oval shapes in a variety of sizes. Barbara will guide you in creating a stunning Blue Onion quilt! Learn to make this fun pouch in the large or extra large size in this class. Five sizes are included in the pattern. Do you struggle with fabric selection and coordinating colors when deciding the fabrics for your projects? Do terms such as "color wheel", "light to dark", "value and contrast" scare you? Fear no more! Join Lenny in this interactive class as she shares tips that you can use to see fabrics in a new light. You will learn about color choices, printed designs and how to make them work to your advantage when choosing fabrics for your next project. Another wonderful paper pieced quilt - taught by Edwina - pattern by Judy Niemeyer. PREREQUISITE: Intro to Paper Piecing Class or prior paper piecing experience. Learn to make curves with a template. Edwina's patient teaching makes this class a winner!! No pattern necessary. You will need to purchase a template. Join Diane to make the Fika Tote (Fika is a Swedish word, meaning to have coffee). This tote has features like front pockets, a back lapped zipper pocket, recessed zipper closure and padded pockets. It has a padded interior pocket and can fit most laptop sizes. Approx. Finished Dimensions: 17" wide, 15" tall, 5" deep This class is for an advanced beginner who has experience with cutting. The first class will mainly be devoted to cutting out materials but also sewing as time allows. Learn paper piecing with Edwina . This is an absolutely beginner paper piecing class. You will learn how to paper piece by sewing this simple block. Kit is provided with the class fee. Lemoyne Trails is a beautiful pattern that combines the Rapid Fire  Lemoyne Star and the Snails Trail blocks. Use 10-2 fat quarters from your stash or get some new ones! Either way, this will be a stunning project. Jellyroll and Fat Quarter Friendly - Uses the Quiltsmart printed interfacing pack to make a beautiful lone star quilt. 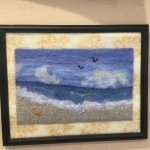 Lenny will teach you how to make a beautiful landscape with the needle felting technique. You will need a needle felting tool, wool for background and wool roving. kit will be available from Lenny the day of class ($18.00). 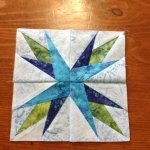 In this two part class, Irene will show you how to start with one fabric, cut and make unique kaleidoscope blocks. Once the blocks are made, you will design your own one of a kind One Block Wonder Quilt! Join Edwina to paper piece a cute Christmas tree. Your choice of tree size. PREREQUISITE: Intro to Paper Piecing Class or prior paper piecing experience. Learn to use the Creative Grids Pineapple Trim Tool while making this beautiful quilt. Use your scraps or buy new yardage. Make it colorful or use two colors--a light and a dark. Use homespuns, cottons, or batiks. There are lots of options for this quilt. The quilt-as-you-go-technique (QAYG) is an easy way to join quilted pieces by machine. Lenny will teach a QAYG method that allows you to quilt your project as you piece it. This is a TWO day class. Cutting prior to class is required. Learn a great technique to take your free motion quilting to the next level by adding ruler work. Learn how to use long arm rulers... whether on a long arm machine or a domestic machine (requires free motion ruler foot.) Learn the steps to get perfect designs and precision that comes with using rulers and then learn different techniques to make those designs stand out! Start saving your selvages today! We will be making a small zippered pouch in this fun class to introduce you to all the possibilities for using selvages. We will have plenty of different project samples made using selvages to show you during class. To cut your selvages to use in projects, cut at least 1 inch wide measured from the selvage end. How long your selvages are depends on the amount of fabric you have to begin with. All lengths are good to save because you will use them eventually. If you do not have enough selvages saved for class - no worries, the instructors will have extra selvage pieces to share with you. Fun, Kaleidoscope blocks are quick and easy to make once you learn how to cut the fabric. In this class, Irene Chandler teaches quilt designer Bethany Reynolds' Stack n' Whack technique. Learn the basics of Tee Shirt Quilt Construction from selecting and cutting your shirts to piecing the quilt, in 2 sessions. You will learn how to prepare your Tee shirts for use in a quilt and then how to put them together with sashing and borders. Join Lenny to learn the basics of wool applique beginning with basic applique stitching. 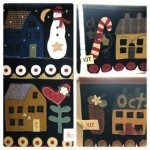 You will choose a wool applique kit to work on during this class. Fee does not include the kit. Photo shows a sample of a few kits that are available to purchase. You will, for sure, want to make more than one of these adorable wooly trees. Everything is included in the kit for the class to make one tree (44 branches). The instructors offer a wide variety of beautiful wool to construct the trees and at the end of class you will be taking home your own finished tree!!! Make this full size Wooly Wreath for yourself or as a gift! No doubt you will want to make more than one! Everything is included in the kit for the class to make one wreath. The instructors offer a wide variety of beautiful wool to construct the wreaths and at the end of class you will be taking home your own finished wreath!!! You will surely want to make more than one of these adorable wooly wreaths with lavender flowers. Everything is included in the kit for the class to make one wreath. The instructors offer a wide variety of beautiful wool to construct the wreaths and at the end of class you will be taking home your own finished wreath!! !